SOMETIMES all you have to do is ask nicely and some of the world's problems can be fixed without too much trouble. 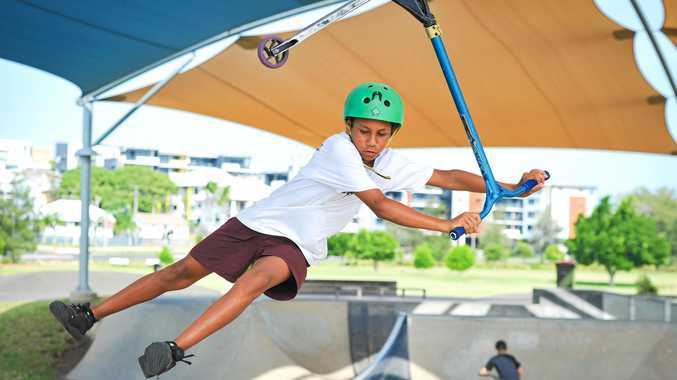 That's exactly what happened when The Observer photographer Mike Richards met up with a group of young skaters at Gladstone's skate park on Monday. Caleb Walden has been coming to the skate park on Yarroon St with his friends for six years, to practise his scooter tricks. But the action was dampened this week after rain left a large puddle. Caleb showed Mike how the puddle had formed in a depression in the skate park's concrete structure. "They should put a drain in the bottom," he said. The puddle, along with one other, has been forming on the skate park after rain since the park first opened but Caleb was quick to point out that the council probably wasn't aware of it. "It takes three to four days to empty out after the rain gets in the gaps in the shade cloths," he said. Until now, the boys have been trying to deal with the problem by sweeping the water out with a broom. But they say in its current state the park was a safety hazard and they were worried more inexperienced skate park users could get injured. Another regular user, Sai Wilson, said riding through the water caused the bearings in his scooter wheels to wear down, and they cost $60-$80 to replace. The Observer contacted the council yesterday and within hours a solution had been organised. Executive services manager Michel Colen said it was sometimes only when the public brought things to the council's attention that the council became aware of a problem. After inspecting the park, the council plans to deal with the problem of water pooling at the bottom of the concrete structure today. "The main problem is on the northern side of the park and we hope to have a drainage solution in place by today," Mr Colen said. He thanked the boys for bringing the issue to the council's attention and added that any water remaining after today's work would have to be swept out. And then it will be back to business as usual at the skate park.